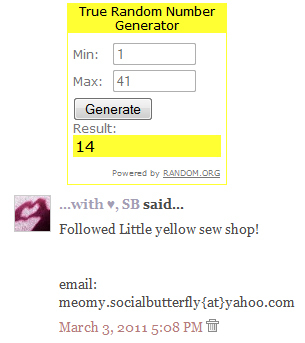 Congratulations, Amber on winning the first Giveaway that Love is Everywhere has ever held! Thank you to Amanda at Little Yellow Sew Shop for giving everyone this opportunity. She has also been wonderful enough to offer a coupon for 15% off any item in her shop, not including sales tax and shipping. This coupon is good for one transaction through the month of March at Amanda's lovely shop. Stop bye and check out all of her fabulous items!